Ever since I first heard someone mention that mobile phones were “Africa’s PC” I was hooked. I still am. My most recent trip to East and Southern Africa has done nothing but confirm my thoughts on the mobile platform as Africa’s connectivity device. As much as I love the OLPC, and I know it will have an impact, I can’t help but think that it won’t reach to the base level of technology needs in Africa. All of the issues that people point to as problems for web connectivity in Africa – be it low bandwith, poverty, the technology learning curve, access to software and hardware – are solved with this one device. Further thoughts on mobile applications for Africa were spurred on by some meetings with different individuals while in South Africa and Kenya. Angus Robinson, a South African mobile consultant, and I had a good discussion on some of the older hash-based services available through the carriers. Earlier that day I had discussed some services (J2ME) that about 4 million South African youth were using called MXit. In Kenya I was a part of the Mobile Toolkit Workgroup meetings where the group was trying to come up with a package of educational material, software and services for NGOs. While there I met up with Geoffrey Muthondu, a young man who is working with Nathan Eagle’s EPROM project to create a mobile stock trading platform. I talked late into the night with young techies in Nairobi about how we can change East Africa with the right mobile applications. In Uganda I spoke with the principals of Simba Telcom, MTN and a small web/mobile shop that is trying to revolutionize the way people communicate. The talks with this group left me charged up – these are exciting times to be in the tech space in Africa indeed! The resounding story is this; Africans, and those creating things in Africa, are doing it with the mobile phone. It’s not that they are ignoring the web, it’s that they realize first-hand that the mobile phone is the platform of the masses. Any serious penetration of web-like structures, information and connections will have to take place there. Don’t think that these will be just SMS, or just data. The future is a mixture of voice, java apps, SMS and web connectivity. It’s where the web and mobile worlds meet. In fact, anyone who is serious about Africa will not just develop for the web, or just for the mobile phone, they have to address both. But, Where Were the Hippos!? Is there any killer app for the simple, cheap and very popular Nokia 11xx series (except for mobile banking)? Word Hash, I agree and I think this is the strength for the future in Africa. While a business can reach critical mass with a web structure in the Diaspora, they will need a mobile platform to effectively serve customers in Africa. JKE, there aren’t any killer apps for mobile phones in Africa yet. That’s why it’s such a big opportunity though. The thing that worries me with phones compared to proper computers is that on phones, we’ve all more or less accepted that the manufacturer tells us what we’re allowed to do and not. It’s a platform that is not very open. I think OLPC-style projects still have their place, because they let users be creators rather than just consumers. Harald, what about http://www.openmoko.com/ then? Harald, though the platform isn’t as open as the PC, that doesn’t mean the infrastructure isn’t there to do some really interesting things. A good place to look is using data services to start connecting to databases for mobile-based services. We’re seeing that all over the place actually. Sometimes they’re hooked into java apps, many times they work directly with SMS too. So, though there are more options on the computer platform, that doesn’t mean we can’t still develop some outstanding things for the mobile phone. The snip against OLPC was unintentional, I’m sure. I, for one, will cut you some slack. Saying that the project “wonâ€™t reach to the base level of technology needs in Africa” is a bit unfair, as it implies that mobile computing will do the job “better” or more quickly. Not gonna happen. You can put as many killer apps as you want into mobile phones, people have bitten the apple of desktop computing and want its power, and more. The Mobile platform is gravy to computing empowerment, not a substitute meal. Same applies to data services, but also infrastructure. I hope no one is kidding themselves that African mobile data networks are ready even for regular Internet usage, and their costs are higher than in more developed world-regions. How telecomms will developed their networks and find affordable, and profitable, pricing schemes is a huge challenge for the next 10 years. E-Nyce, don’t take my comments about OLPC wrong. I’ve posted a number of times over the last year in strons support of it. Regardless of what happens in the mobile space, I think that inexpensive laptops have a place – for both children and adults. If the OLPC can pull it off, in a generation we’ll have a completely different group of young adults hitting the world with a completely different outlook on the web and communications. Okay, back onto the main discussion – mobile phone applications. Infrastructure and pricing are the biggest problems. And developing for the mobile device is no nirvana. I’m in agreement with you. However, it is the one platform that can reach everyone. As seductive as the PC is, imagine offering many of those same services on people’s mobile phone. For instance, Craigslist is huge success due to it’s simplicity. Why couldn’t that same functionality be offered on a localized and regional basis in Africa on the mobile phone? The fundamentals are connecting people locally for a specific reason – perfect, I can do that on a mobile phone too. See where I’m going? That’s why I’m optimistic – someone will create a great application that takes much of Africa by storm. Even with the challenges, the stakes are too high to not try. I’m in on the challenge, and fully support The Cause. We just have to remember: Optimism does not trump Realism. Web 2.0 techniques, coupled with SMS and applications such as the South African mobile payment systems are just begining to merge. User acceptance is the biggest hurdle, but if the interface was secure, simple, easy to access and low bandwidth, it could go viral. There is a huge demand. In the meantime, check out twitter.com or one of the similar services. Twitter is bare bones SMS, mixed with RSS, offering cross platform possibilities. The ecosystem is strong, particularly in Asia. 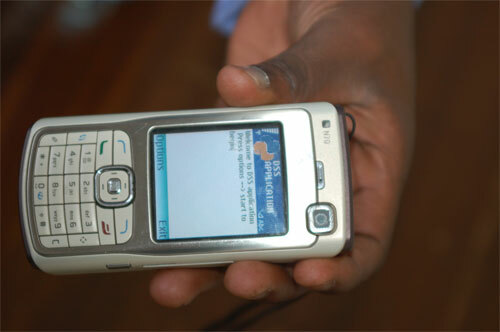 Mobile phones are vital in Africa. How do rural people charge their phones if there is no electricity? How are mobiles charged where there is no electricity? I should like to bring in solar charging stations that can be operated by one single person, who would charge a small fee per mobile charged. I need importers/distributors on the ground, who can help me realize this project.